The fog comes on little cat feet. 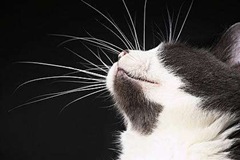 I began to read that one to my shiftless cat, to try it out in the air, but she is no more, having left on silent haunches, a vapor leaving no trace. Before reading those little poems, I filled the bird feeders in our backyard, while three sparrows twittered nearby, waiting. The feeders showed the marks of squirrels who had gnawed at the rings below them, their metal tops, even peeled paint from their sides, to no avail. Finishing, I walked the fence at our property line, noting the place where the remains of our pets are buried, the piled pine straw and leaves springing to my steps. Once, I turned back to look at our home, dirt to sky, for a moment trying to see it as someone who did not live there, but I couldn’t. We’ve been here too long, so it’s an extension of us, rooted and real, an appendage. At one corner of the house, a breeze whistles by, a soft thing, silent, which then moves on, blowing by my face, cool. I turn to see a black cat, lean and lanky, gallop through our gate, startled. It turns to look at me, then moves on. As do I. She calls to me from the door. My traditionally-built cat, sister of the vapor, is worried about the strange man walking in the back yard, a slash of light to her cat-eyes, as she sits alert on little cat feet. I call to her, to reassure, thrice, and go in, before night settles, dark and soft, with fog on city feet. Most people have never heard of medical missionary, author, and poet Myra Scovel. Chalk that up to books long since out of print and the presentism that has hold of culture. I’d like you to know her. My used copy of Scovel’s 1970 collection of poetry, The Weight of a Leaf, bears her autograph and the words “For Helen, in memory of David, all God’s best for her, as He has given David. Purdue, 1970.” Nothing like place and time and signature to root a book of poems in reality, 44 years ago. So long. I was twelve when she etched those words. Myra Scovel and her husband, medical doctor Frederick Scovel, met when he was a medical student at Cornell and she a nurse, marrying after his graduation in 1929. The next year they and their newborn son sailed for China as missionaries. After language training in then Peking (Beijing), they were assigned to a hospital in the Shantung province. Pre-war, pre-communist takeover, they were treating opium addicts and every kind of illness until internment for six months by the invading Japanese in 1943. Deported by the Japanese, Myra had her sixth child within hours after their ship docked in he United States. In 1946, after the war, they and their six children returned to China, remaining there until 1951 when, like many other missionaries, they were forced out by the Chinese Communists. After six years service in India, they returned to the United States for good in 1959. That story you can read in The Chinese Ginger Jars, Scovel’s memoir published in 1962. The narrative moves at a quick clip, like a nurse on duty, and yet her descriptive powers are on display, as in this line about Peking: “The whole city seemed steeped in the culture of its people, mellow as the smooth cream ivory of its curio shops, wise with a wisdom drawn from the deep pools of its clearest jade, relaxed as the curve of a temple roof against the sky.” Oh, how the world has changed. But all of this, interesting as it is, is just the soil for the flowering of Scovel’s poetry which, though faith-rich, is rarely sentimental, preachy, or limited to religious themes. That sets it apart from much other “Christian” poetry of that time, and that’s what makes it so human and readable. That and its economy. “Shall goodwill ever be secure? As she finds herself in Li Po’s poem, on the eve of yet another world war, so we can find ourselves in Scovel’s careful words. all the dear, accumulated rubbish. down to the bare essentials of my being. She doesn’t wholly escape sentiment, particularly when writing of family, but neither does the award-winning Mary Oliver when writing of her beloved dogs (in her Dog-Poems). Even a fine poet can lose the universal that makes a poem timeless, that makes it matter to readers she does not know, when writing about those things they hold dearest. We can forgive. Myra Scovel’s poems are light. Spare. Full of space. And yet, even a frail and hardly noticed leaf of a poem has weight. In a world of brash narratives and self-important posts, a little poem can shine, quietly whispering Truth. Find the poetry of Myra Scovel. Whether in the dust and ink of the used bookstore or the low-ranking pages of Amazon, dig it out, take up, and read. The economy of a poem is its virtue. Every word of a well-crafted one must count so much that the acres of blank space on the page pour out meaning as well, rich in its absence of words. At least it does with Mary Oliver's poems, poems which are deceptively simple yet profound. So she goes down to the shore. So do we all. This is not a going just to walk, to gaze on beauty, to enjoy the sea air. She is going to the edge and staring out into Creation with questions: Why? What now? And so I have been down to the shore, the edge of the city, to a forest in the early morning, alone. Last year, in April, I went to a nearby state park alone on several mornings in the space of several months. These were not nature walks, in the sense that I was there to observe the forest, the river, the bird life and fauna. I was there to be alone and hear and see the regularity, the mundanity of a rock and stream and forest that pre-existed me and will live on after me, that will keep on. My mother was dying. I walked a long sentence, stretching out the length of the path, a sentence saying what shall --- what should I do? And the ancient river and stones and trees said, as they always say, Excuse me, I have work to do. In her essay, The Quotidian Mysteries, Kathleen Norris reminds us that the "divine presence is revealed even in the meaningless workings of daily life," that "it is in the ordinary, the here-and-now, that God asks us to recognize that the creation is indeed refreshed like dew-laden grass that is 'renewed in the morning'" (Ps. 90:5). And so I walk. I do the mundane work of putting one foot in front of another even when that is all I can do. I dig a path with my question. Some questions have to be taken out and walked, given space in which to percolate. The rhythm of footsteps, like the beat of my heart, answers my restlessness. What should I do? Some have said that poetic meter --- even the common iambic pentameter of so many poems and songs --- originates in the bodily rhythm of arms and legs in motion. Even more, in the beat of our own hearts. So when we walk, we hear music, we make music, reconnect with the song at the heart of Creation. We consider the barely perceptible rhythms of a natural world whose work is excruciatingly slow: trees inch upward; maples and sweet gums shed their leaves reluctantly, oaks resist; rocks are sculpted ever so gently by wind and water and their ceaseless caress. Excuse me, I have work to do, they say. In the end, when I go down to the shore, when I step out on the earth and walk, I am reminded of the God who made me, of Christ who holds all things together, of the Spirit who works unceasingly, who stirs my heart to worship. Walking becomes liturgy, a regular path to praise. My breath, my heart, my stride, my motion --- they all remind me of my creatureliness, and that of my Creator whose image I bear. And then, like today, something enters that rhythm, that mundanity of my existence --- a dog, smiling, approaches; a gargantuan leaf flutters down and catches in my wife's unsuspecting hand, as if God placed it there; a lone white birch tree sways slightly against a sharp blue sky (look up, it says); the gnarled roots of a what seems a prehistoric tree clutch the river bank; leaves crunch underfoot, announcing our coming. Skipping rocks in the riverbed, I accidently plunge my foot, boot and all, under water. I laugh. What shall --- what should I do? It is God who answers: Excuse me, I have work to do. While I did not know of the poetry of the late Jane Kenyon until after her death in 1995, I am glad I found her when I did. A kindred spirit to Mary Oliver, who is one of my favorite poets, her poetry also has a rich simplicity --- is accessible, delicate, and yet profound. Images of home and nature abound, and a subtle faith and hope permeates the air of her poems, even if they often allude to her lifelong struggle with depression. Take this one, for example, entitled "Afternoon in the House:"
I know that sprawl, those favored places, that quiet that settles on the house, that hyper-consciousness bred of aloneness that makes you sense that the very walls are listening, leaning in, waiting to hear. It's all so ordinary, and yet under her economic pen, buffered by considerable white space, it becomes extraordinary, each word so carefully chosen. And that makes me look up The Meadow Mouse since, after all, no poem about a cat can be bad, can it? And yet I realize, in the reading, that the cats enjoyed it like we might anticipate a scrumptious meal, licking their chops. Reading "Do I imagine he no longer trembles/ When I come close to him?/ He seems no longer to tremble," I fear it's not empathy they feel for the poor mouse but something more elemental, and base, and so my instinct about cats is confirmed: they are out for themselves, won't ever be accused of saving children from burning houses or lying down on their master's (if that word is ever accurate) graves. And so I wonder if Kenyon granted the request. I doubt it. Rather, it demonstrates her sense perhaps that not only cats but her own species might not be generous. And that, for Kenyon, might have fed her depression. because, inexplicably, I just wrote a line nearly like that in a blog post just a couple days ago when, awake in the middle of the night, I said that the listening you do at that wee hour is "like you are hyper-attuned to the settling of the house, like some ancient creature sinking back down on its haunches long after its occupants have retired." You know it's bad when you take to quoting yourself, and yet why did I channel a phrase uttered by Jane Kenyon when I had not read her poem in perhaps six years? Are they with her? For Kenyon even a good day held within it the seed of a bad one, a sense that the shoe had to fall at some point and the world would come crashing down. Who knows what else frightened her, when even the cats are full of malevolent possibility? I don't mean to be hard on cats. They figure prominently in Kenyon's poems, often dozing, sometimes providing humor, and yet for her nothing could be taken at face value, the sinister lurking beyond the benign. One phrase, repeated in her poem, "Otherwise," the title to a collection of her work, tells me of her commitment to live even when she felt otherwise: "All morning I did the work of love." More than fear or sadness, her poems tell of hope and faith and love, and that trilogy is worth hearing about over and over and over. Want to read Jane Kenyon? Start with "Otherwise." You'll find much to love in her descriptions of the ordinary. You might even make your own poem. Tiger is the name of the barn cat that lives at Connemara, the home of Carl and Lillian Sandburg for the last 22 years of the poet and writer's life. A hospitable cat, welcoming guests easily from the red barn she scouts, she makes us feel at home, as if we have come to visit the Sandburgs, see Lillian's prize goats with their soft and docile faces, peruse the 14,000 volumes of books in the Sandburg home, or sit on the front porch and think and talk and think some more, enjoying the view of the lake and the mountains beyond. And we do feel at home. My first experience with the American journalist, poet, folk singer, and hobo Cal Sandburg was as a child. His six-volume biography of Abraham Lincoln contained in my mother's library of mostly devotional books (many of which I read at some point) intrigued me but proved too fulsome a history for a tween to crack. But I remember its heft, the feel of it in my hands, and the weightiness of its many words. I wondered at a man who could write so many words about one single man. I looked at his picture, his shock of white hair, and thought him a word-god, transcendent. He wasn't, of course. Walking through his house, left much as it was the day he died, I sense his ordinariness, his humility, his modesty. I can imagine sitting in his front room visiting, the furnishings plain and simple, the man unpretentious. He might read me a new poem or even sing me a song. The only thing unusual about his home was his sharing of it with 14,000 books. Everywhere you bump into words, rub up against history. There he sits, I imagine, in a cluttered study, banging out the words to a new poem, typewriter on an upended orange crate, because "if such was good enough for General Grant it's good enough for me." Pulitzers are relegated to a hidden cabinet, no "how great thou art" wall of commendations and awards to be found. No car in the garage either, as he said that a car would keep him from walking, and in walking you get to meet people. And people were his stock and trade, the very voices of his poems. On a granite outcropping beside his home, there is a single bench chair, and I imagine him sitting there, paper and pen in hand, thinking over his life and the life of others he knew. He said once that "[i]t is necessary now and then for a man to go away by himself and experience loneliness; to sit on a rock in the forest and ask of himself, 'Who am I, and where have I been, and where am I going?'" There, at the bottom of Little Glassy Mountain, I might ask myself that too and, turning back to the house, ask myself what I will leave behind. I would like to have known the man. I doubt our politics would align (as he was a socialist of sorts), and yet he championed the rights of the ordinary folk and seemed to live his life with some modesty and humility, a voice for the common man. He also held to no organized religion and, though it was not a major theme of his work, did at times rail against those he thought misappropriated Jesus, as in his vituperative lambasting of the evangelist Billy Sunday in his poem of the same name, saying "I won't take my religion from a man who never works/except with his mouth and never cherishes a/ memory except the face of the woman on the/ American silver dollar." Surely, had he read the poem to me on the porch of Connemara, I may have nodded in agreement to parts of it, because much has been said and done in God's name with which He may not be pleased. Nature had a way of smoothing over his rare venom. Even in many of his poems not geared toward children, a gentleness is evident, as in "The fog comes/ on little cat feet./ It sits looking/ over harbor and city/ on silent haunches/ and then moves on." I imagine him playing with grandchildren, watching Edward R. Murrow on television (the only thing he ever watched), sitting at a modest table having breakfast with Lillian and his girls, watching birds out the window, and retiring to his office upstairs, cluttered and discomfiting to me, anyway. Was he a friend of this man? Did he know the One who haunted all the lives of the people he met, the places he saw, the words he wrote? At Connemara, I can hope that he knew more than the dark, dark night from a rail car window, with only slashes of light. I can hope he knew the God-Man who came to save. In his inimical way, G.K. Chesterton once said that "the poets have been mysteriously silent on the subject of cheese." Perhaps what he was saying was that there aren't many topics that poets haven't spoken to except for cheese, yet who knows what he meant? I don't care. It's fun to hear even if I don't understand it. That's true of poetry too. Even when you don't understand it on the first or second reading, or at all, it should still be fun to read, to hear the music of the words, to see in your mind's eye the images it provokes. And yet sometimes a poetry comes along that is both accessible (if still a little mysterious) and fun to read and listen to. That would be Mary Oliver. In her latest book of poetry, Swan, Oliver, now in her mid-seventies, does not disappoint. This book of 47 poems and much white space simply blesses the reader. She doesn't stray from the familiar places and themes she has explored in other books --- nature (that of the marshes and beaches of her home at Cape Cod), faith (albeit non-specific), aging (with grace), and her faithful companion dog, Percy. Reading these short poems I find welling up in me a deep thankfulness for all that God has made, for life itself, and a wonder at a Creation that continues to supply a poet's inspiration, even in her 75th year. That alone is reason enough to purchase the book. dark clouds and slow rain. The rest of the page is blank, white. I think to myself how absurd it is to spend good money on mostly blank pages, and yet if you think like that you won't read poetry much less buy it. In this world where information stretches from edge to edge of monitors and videos beckon and text splashes, flashes, and scrolls across the screen, poetry reminds us of how thin and shallow all that information can be, and yet how four short lines can be ridden to deep wonder. If you stop, that is, before you press on. I am getting beyond that. the tulips, and the pines? Reading these poems, I find it appropriate that the poet quotes Emerson in her epigram at the beginning of the book: "'Tis curious that we only believe as deep as we live." In one poem, there is this wonderful line --- "Joy is not a crumb" --- and I think, how could it be? To look deeply at Creation, to see the world God made in all its richness, how could one be anything but awestruck, almost wordless, and Oliver is, like the good poets, economical in words but liberal in heart and spirit. She writes on and on about swans, foxes, pines, squirrels, turtles, woodchucks, the sun and moon, a lark, the herons, beans green and yellow, the pepper tree, morning and night --- a lexicon of praise, almost --- almost, that is, if she could but plainly acknowledge the Maker of all this life. (In all this particularity, one poetic misstep: the word "Obama," jarringly out of place!) Still, she is more profitable to read than many so-called Christian poets in that her poems are rooted in the particular, in a natural revelation, not in religious abstractions. They incite praise, intended or not. In the end, Mary Oliver, who in the first poem of the book wondered what she had left to say, reacts to the real or imagined prodding of an editor who told her to fill up more pages with this: "So, this is all I can give you,/ not being the maker of what I do,/ but only the one that holds the pencil." So that's it: a gospel superintended, and Mary Oliver a faithful apostle of that truth. That's enough for me. If as Robert Browning said, "God is the perfect poet," then Mary Oliver is "the almost perfect poet." If you want your money's worth of words, don't buy this book. But for those of you who treasure an apt word and can take a mostly empty page as a room in which to wander and wonder, buy this book. Read every poem at least three times. Read some aloud. And then wander and wonder around outside and make your own. "Try listening to a lecture or sermon as if you had never heard English before. Listen for the flow of syllables --- some strong, some weak. What do we mean by an accented syllable? Is it louder? Does it take longer to pronounce than its neighboring syllable does?" Pretend the pastor is not speaking English, a not far stretch of the imagination with some pastors, I know. Listen not to what they say but how they say it. Why stress what they stress? Why pause where they pause? What accent the syllable they accent? Speech is poetry, really, with a musical quality about it. Poet Suzanne Clark reminds us "that the most prominent sound pattern in English is an unstressed syllable followed by a stressed one. When used as a deliberate pattern in a poem, it is called an iamb. . . . Of course in speech the pattern is random and inconsistent." In poetry, she says, order is brought to the randomness: "The iambic meter --- presenting the pattern at regular intervals --- has historically been the prevailing one." Even when random and inconsistent, the intriguing thing about the iamb's prevalence in speech is that it always surfaces. Just listen to the sermon. You'll hear it, the rising and falling of stress, the rising and falling of voice. What it is, I believe, is our unconscious imitation of the "THUMP-thump" of our own heartbeat, the music we effortlessly make, our own internal rhythm. And that, I suspect, is a rhythm built into Creation itself --- "there was evening, and there was morning --- an iamb placed in Creation by a God who some believed even put in Creation a "music of the spheres." Hmmm. And then, perhaps all this is a lot of rubbish. Nevertheless, listen to the sound of the sermon anyway. You may just wake up to more than its iambs. "Beautiful words have interesting sounds with value quite apart from sense," says Clark (once again, a good thing in respect to some pastors). So listen. And then when you bow for prayer, put your hand to your heart and realize that there is a reason you sound like you do. And let a small word of praise escape your mouth that that beat goes on, and on. "A writer looking for subjects inquires not after what he loves best, but after what he alone loves at all." What is it that I alone love at all? life inside and life outside, the separation by only a pane of glass. fact that they have our back. roundness, its shapeliness, the way its sound hangs in the air. thought of what worlds I am breathing in. live on in heightened color, sound, and smell in eternity. the sound of God walking among the words, His words, His world. But then, maybe you love this too. Maybe it's not mine alone. If you pick up a collection of modern poetry, you would probably not use the word "beautiful" to describe what you would find there. The language can be coarse, the images jarring, the implicit and elitist assumption being that most people just won't "get it," so why bother. At the risk of engaging in gross generalization (which it is), most modern poetry is dark and inaccessible and, even if you try to read it (which most people won't), the task is daunting and darkening. However, there are exceptions, even wonderful exceptions, so if you do not read poetry and are willing to start, I recommend you begin with Mary Oliver or Jeanne Murray Walker. Neither are prone to sentimentalism and both employ earthy imagery and craft words that scatter light from every page. Do you think of them as decoration? until death, the instruction to be green. to pronounce a new year. May I invite you to revise your thoughts about them? these brothers and sisters, quietly and deeply. to the old, holy ways. Simple yet profound, accessible yet not pedestrian, Oliver's poems are rich with ponderings on the meaning of natural things and well worth spending time meditating on. To truly enjoy them, read them aloud. Poems become three-dimensional when you not only see but hear them. While nearly all of Oliver's poems are rooted in nature, Jeanne Murray Walker's somewhat more complicated verse dips into relationships, emotions, normal everyday affairs like putting children on a school bus, as well as nature. Reading through her latest offering, New Tracks, Night Falling,the first thing you notice is that the poems are often longer than those of Oliver, both in line length and total length. This makes you slow down. The other thing you observe is that the references to Christianity are more direct, though certainly religion is not the topic of most of the poems. of sparrows rise and scatter through the dawn. got to hold still enough to feel the wings flutter. "Reading a poem is like following tracks to an interior realm," says Walker in the preface, a realm of deep questions like "why I am so prone to do what I don't want to do," or "how is it possible to overcome the deep loneliness of being a seaprate, conscious human being," or "why does grace sometimes visit us out of the blue?" She describes poetry as a "wistful groping toward the truth" and poets as "organizers of the hunt." She's right. If you sit long enough with good poems, they raise questions that lead to the mysteries that only God has the key to, that only He can reveal or absolve by His presence with us. In fact, the main tool I would pack for the hunt is a mind filled with God's words, a flashlight for the journey. Not only that, I want God along, because I know that though I may not find all or many of the answers, I will have Him, and in Him I have all I need. Read poems. Start with Mary Oliver and Jeanne Murray Walker. Read God's words as well. Sift the poets' words with the words of the One who made us. It may take time, but it's worth it. One of the distinctive features of the Hebrew Psalms is a literary device known as parallelism. While less rich a device in the translated English, it nonetheless remains a feature of most of the Psalms, a curious or perhaps sometimes irritating tendency to always be telling us the same thing twice, as if we didn't get it the first time. The Psalmist tends to repeat himself, as if we need to hear a second time so we understand. See what I mean? It can be irritating to be told the same thing twice. And yet it's not so in the context of poetry because phrases are not being repeated so much as to teach, to emphasize a point, as they are to produce beauty in their cadence, in their appearance as words on a page, in their sound. C.S Lewis, in his book Reflections on the Psalms, declined to ascribe the Psalter a purely didactic function, noting that it seemed "appropriate, almost inevitable, that when that great Imagination [Who]. . . had invented and formed the whole world of Nature, submitted to express Itself in human speech, that speech should sometimes be poetry. For poetry too is a little incarnation, giving body to what had been before invisible and inaudible." I encourage reading the Psalms aloud and appreciating them as poetry, as audible expressions of the sometimes inarticulable longings of the human heart. The parallelism is there by providential design to heighten the beauty of the form God used to express his truth through very fallible wordsmiths. It's only a visible expression of a godly parallelism in all of life, the repetition of the good, every day. 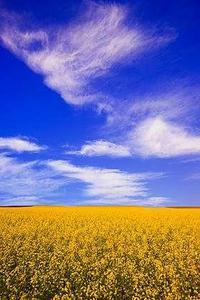 There's great assurance in that, a good rhythm of life, so enjoy the parallelisms of life. Enjoy them. Now, let me say all that again in a slightly different way. . . .
reign and rule. . .
To Giver be all glory. barely noticed. I am lost. from a thousand miles away,"
Honest, haunting, human --- all might describe Pulitzer-Prize winning poet Franz Wright's poetry. 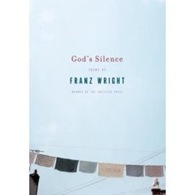 Wright's latest collection, God's Silence, features just short of 100 poems, from one line on an otherwise white page to a longish poem covering four pages, exploring death, nonspecific hardship or trauma, or other loss buoyed, if you will, only by God or, more accurately, God's silence, and yet God nonetheless and with constancy. This is obviously a prayer to God, a psalm the poet cries out, and yet we know not why, know not what pain inflicts him. It is not ineffective, as we might supply our own pain, our own particulars for the petition, and yet would it not be better to root this in particulars, making it more accessible? But this is the exception. At least half of these poems lack context and particulars, providing a feeling but no framework to hang it on, nothing to quite identify with. Cryptic fragments, mostly. But who am I to criticize? The man won a Pulitzer! for sixteen years a day. they too come from the light at the beginning of time. Proved faithless, still I wait. Critic Denis Johnson has said, of the poems of Franz Wright, "They're like tiny jewels shaped by blunt, ruined fingers--miraculous gifts." Sometimes they are jewels. Sometimes they are just blunt. But always they are haunting pleas to a God who is really not so silent, to a God who is there. Silence can be deafening. I confess that when it comes to poetry I am a beer-drinker and not a wine-sipper. Not that I partake of either drink: beer makes me sick, and good wine is wasted on me because I have not been schooled in its pleasures. But I like my poetry accessible --- artful, thoughtful, and yet written in language I can understand. Like beer, my poetry is that of the common man. In this regard, the fine wine of T.S. Eliot's poetry fails me or, rather, I fail it For example, it's well nigh impossible to understand the literary allusions his The Four Quartets makes without a serious grounding in literature and language. I haven't the background nor patience. And yet I cannot deny the sound of his work, like the cry of meaningless that comes through The Hollow Men: "This is the way the world ends/ This is the way the world ends/ This is the way the world ends/ Not with a bang but a whimper." We just fade away, he seems to be saying. William Edgar, a Fellow of The Trinity Forum, offers a helpful analysis of Elliot's poetry in an article in TTF's online journal, Provocations, entitled "Shoring Up the Fragments: Thoughts on T.S. Eliot's Poetry." Edgar actually knows what the poet means. I don't, and yet I love to ponder such lines, and listen to such sounds, as one may find in The Love Song of J. Alfred Prufrock: "Let us go then, you and I,/ Where the evening is spread out against the sky/ Like a patient etherized upon a table . . ." I have no idea what that means (and neither did his critic, C.S. Lewis, profess to), but I love the sound of it. I even love the sound of the title. Who wouldn't want to meet a guy named J.Alfred Prufrock, to find out what he looks like, how he thinks? Poetry is about crafting words. It is not data, but lyrical, imaginative verbal invention. Unlike other art forms, even creative prose, poetry addresses the soul at its very source, at the place where language intermingles with deepest consciousness, with God’s own image. At first, his many quotations and references seem almost distracting. Then after reading and rereading the text, and reciting it out loud, we begin to hear, as it were, the work as a whole. If one takes the trouble to decode the references and translate the quotes, then the many parts begin to cohere. Like the great symphony, non-musicians can enjoy it and perhaps hum the melodies. The learned music scholar will hear all the nuances, the different instruments, the cross-references, the historic roots, and the whole will be all the more meaningful. We might even speak of the perspicuity of poetry, its clarity in some essence for the simple-minded, the uneducated (like me), its ability to offer something to the unschooled as well as the scholar. In fact, if a poem can't do that, it's elitist and not much good for culture as a whole. I may not understand the multi-layered meanings of The Waste Land, but reading it over and over again, aloud, I feel its essence in my soul, dimly hear the music of a symphony though I'm more attuned to mere rock and roll. The analogy is inferior, but it's like the perspicuity of the Gospel: clear enough to lead even the dim-witted to Christ, and yet full of unfathomable riches for the Edgars of this world; clear enough to offer me something of its meaning, to evoke feeling, and yet richly layered enough to offer much more than that to the learned reader. It's enough to make me take to drink --- your best wine, please. 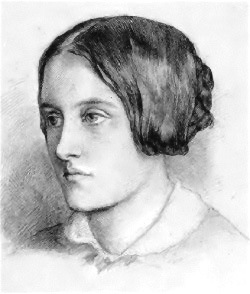 One of the reasons that I am enjoying some of Christina Rosetti's poetry is her melancholy disposition. While the word "melancholy" can mean gloomy or depressed, it also means a sober thoughtfulness, or pensiveness, and as I understand it that is a more traditional and perhaps biblical way to approach Advent. Rosetti seems to capture that in two of my favorite of her poems, the two set to music and sung by everyone from The Kings College Choir to Julie Andrews to Sara McLachlan. It's not surprising that Rosetti was "soberly thoughtful." While she was born into a well-off London family in 1830, when she was about twelve or so, her family suffered severe financial difficulties because of her father's debilitating physical and emotional illness. At 14 she had a nervous breakdown, and thereafter she suffered from bouts of depression. She came to faith in the Anglican church, perhaps as a result of all her trials, and she was devoted to Christ the remainder of her life. In fact, though she became serious about two men, she married neither, both for religious reasons. She remained unmarried the rest of her life. So, she lived with her mother , and after her mother died, alone. She's not unlike some other hymnwriters or poets whose best work seems to proceed from their most difficult trials. In the midst of all those cheery Christmas songs, I continue to gravitate to the sobering songs, the ones that acknowledge the reality of sin and the difficulty of waiting. 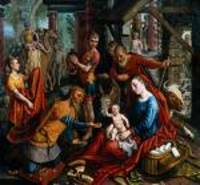 Advent is all about waiting, and it's not over with with the birth. We wait for the promised death of death, for the setting right of all things --- including me. O Jesus, drink of me. That's what we are: fallen leaves, faded leaves, broken bowls. And yet He comes to make us whole, dying so we might live. Rosetti was serious about faith. It's said that she gave up playing chess because she thought that her wish to win the game had become too strong. She believed that this would be a chance to become a more humble believer. When I read that, I thought it sounded crazy, but then it made me realize how inattentive to my sin I am, how little I think about the passions and motives that drive me. I don't play chess. But I need more sober attentiveness to my life. I need to make a move. When Armstrong, Aldrin, and Collins were hurtling through space toward the moon in Apollo 11, they had no idea what they were hurtling through. We still don't. At least we don't know much. In fact, my cats may know just as much for all I know. I think of space as emptiness, as the absence of things, or matter, and yet scientists say that's not really the case. As I understand them, outer space is not completely empty (that is, a perfect vacuum) but contains a low density of particles, predominantly hydrogen plasma, as well as electromagnetic radiation, dark matter and dark energy --- mostly the latter two "dark" twins, except we really don't know what they are or if they're really there (kind of like imaginary playmates). For instance, dark matter is said to be a mysterious substance which scientists think accounts for most of the mass in the universe but that is invisible to current instruments. We don't really know for sure that it's there, and yet this stuff we can't see accounts for 96% of the universe. But you know scientists; they positively live to postulate. But enough of that. I think of space more in the sense of spaciousness, an openness filling the yawning gaps between good solid things like trees, stars, and people. There's a lot of it around. God made it, so he must love it (says Plantinga), and given how much of it there is, he must love it a lot. God does love space --- the sparseness of it, the roominess of it, the solitude of it, the wonder of it, the silence of it, and the noise of it. And so should we, or so do we, but for sin's curse. Because of sin, some of us can't abide being alone in the solitude of space. Agoraphobics, those who fear open places, hide in their rooms, undone by the expanse of space and place. And some of us, like nettling bureaucrats, rush to fill every interstice of human experience with a regulation, rule, or command --- legalists to the core who can't abide the inevitable space in our codifications of appropriate behavior. And yet it was not to be this way. Our distant ancestor, Job, marveled at the emptiness of space, wondering that "he spreads out the northern skies over empty space; he suspends the earth over nothing," (Job 26:7) and later concluding that "these are but the outer fringe of his works; how faint the whisper we hear of him!" (26:14). The Psalmist kicks back on the grass outside Jerusalem and wonders aloud: "When I consider your heavens, the work of your fingers, the moon and the stars, which you have set in place, what is man that you are mindful of him, the son of man that you care for him?" (Ps. 8:3-4). Part of what he considers in those heavens is the juxtaposition of visible objects like stars with the vast spaciousness of space, the separation of what is from what is not. Kant said space is relationship, a way to order our experience of reality; Newton, that it was absolute, a part of reality. I think it's both. Sitting in my office, I enjoy space as something real I can move around in and also the sense of space as a juxtaposition of the empty with definite objects like walls and desks and windows. I love space. When I open Scripture to the Creation account of Genesis 1-3, I'm thankful for the vast spaciousness of the Word that made it all. Behind the words "God made" lies a rich and infinite domain of interpretation, of room for human exploration. And when I hear the reassuring words of "Your word is a lamp to my feet and a light for my path," (Ps 119:105), I'm glad the Word is the lamp and not the path, that I have a sure guide but a vast landscape through which to find my way. That's space. That's the kind of space God gives us. (The Red Wheelbarrow). Writing about the poem in Understanding Poetry, poet Robery Penn Warren said that "[r]eading this poem is like peering at an ordinary object through a pin prick in a piece of cardboard. The fact that the tiny hole arbitrarily frames the object endows it with an exciting freshness that seems to hover on the verge of revelation." In other words, more is said by what is unsaid than by what is said. And consider the short story, the poor stepchild of the literary world. (Evidence: The Atlantic Monthly, which published short stories by our finest writers for 150 years, abruptly stopped publishing stories in 2005.) A story like Flannery O'Connor's "The Geranium," which touches in a concrete way on racism, radiates outward into the unknown. Who was Old Dudley? What was his early life like? What will happen to him? We don't know. We can imagine. We can place this snapshot of life in a greater context we supply -- in space. We may not know if space is matter, but we know it matters. If we love it, like God does, if we wonder at it and relish its existence, life will open. We won't be afraid, but free. Dreaming is a state of death, can't you see? We are children of the river we have named "existence"
face, the gurgling creek water, the smell of honeysuckle. If I am His likeness, then what can I do but love the world? And yet sometimes I am unfaithful. I neglect the loving. you remember that song "Sing Me Home Again?" beautiful longing, Creation longing to be set free, to be all lovely, again. Any poet knows that understatement --- saying less in order to convey more --- is a marvelous tool in the expression of truth, particularly in expressing the inexpressible. Looking at the Grand Canyon, one might say that it's a "quite nice view," just to be silly, meaning it's actually an astounding view. You might tell someone you're a "bit under the weather" when they know you've late from the hospital. Well, you see what I mean --- it's a way of speaking that is measured, even graceful, and (in the hands of better writers than me) a powerful means of conveying truth. I think of that Gospel writer who wrote simply "Jesus wept." We could miss it and think that he only wept for Lazarus who, as Africans so delicately say, is "late," but underneath these simple words lie the depth of God's sorrow over the brokenness of his Creation, the ravages of sin, and the curse of death --- a world gone wrong. We cannot and could not bear the inexpressible grief sin causes to God. We could have been treated to a sermon on the grief of God, with many analogies to attempt to demonstrate to us how deep and wide is this grief, but that's not what we get. Simply, Jesus wept. Creation itself is also full of understatement. Walk through a Carolina pine forest and there is nothing breathtaking to take note of. 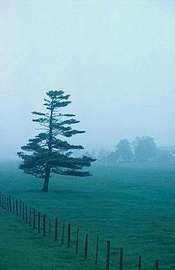 Pines are neither the most beautiful nor graceful of trees. The colors of the forest are not striking, as there are no bright flowers here and there, just browns, greens, and the blue of sky up above the canopy. (Can you really call the scraggly tops of pines a crown, a canopy? That seems too majestic.) And yet, the subtlety of the forestscape is powerfully beautiful, the combination of colors soothing. Stop and listen, and if the wind is sufficiently stirred, and civilization blessedly far, you might hear the subtle language of the trees, their creaking, as if to say "I'm here. Take note." I used to think pines quite useless, good only for pulp mills. But I'll take a speaking pine over a mute hardwood these days. (If you've never heard a pine creak, then you've not slowed down enough to listen.) But I digress into personification! Everyone knows pines don't talk, right? Contrast understatement with the overstated society we live in. If something can be said, it is said. There is no holding back. Whether it's talk shows, blogs, or emails, it's brash and agressive. And then in consumer culture we are constantly being marketed to. I'm sitting now in one of those chic (do people say "chic" anymore?) deli/coffeehouses, and I'm aware of muzak, a very hip jazz medley. Someone deliberated over that choice. Some suit got the big bucks to figure out how to reach me. I think it's supposed to make me feel I'm in a place where things are happening, where the noveau-hip reside. It's plain annoying, too loud and too sprightly for my melancholy. Let me enjoy my melancholic bent, please! I'm bombarded with messages aimed at my wallet wherever I go nowadays. Perhaps it's a result of my having my own business at one time, but whenever I enter a retail store now I'm keenly aware of product placement, lifestyle messages, and consumption ambience (lighting plus music equals buy buy buy). It makes me a little crazy, and it makes me want to stay home. The internet is not much better. Amazon has tracked my buying habits, and so when I visit their web page and get the "Welcome Steve" (and I resent this as I am not their buddy and they do not know me) and a list of recommendations of things that I surely would be interested in buying given what I previously bought, I have to tune out the noise, the feedback of my own choices. Imagine that. Imagine walking in a brick and mortar store and clerks falling over themselves, calling me by my first name, and immediately pushing kiosks with recommended products where I can see them as I walk through, letting me sample this or that item. Ah, they know me. They know my tribe. They know what I need to validate me as a member of the tribe. There's no subtlety here. It's all in my face, all the time. That's the kind of place in which we live, unfortunately. And yet, a walk outside, away from the billboards, city streets, and hawkers of comsumption is liberating. A walk in the woods reminds me that God's economy is diffrent than ours, that even small things like an ant and a leaf or a branchless, creaking pine matter. These not-so-grand, small, and common places of Creation are the real thing, like visual poetry, full of God's understatement: "I am here. Take note." Scripture is full of metaphors. Jesus says he is the door, the good shepherd, the light, the cornerstone, and so on, enough to confound any literalist on Scripture! In fact, there are more metaphors than similes: the gospel is not fenced in but runs wild, uncontained. We ask how is he the good shepherd, how is he the door, and our minds run free with the associations, bounded only by other portions of Scripture as impressed on our hearts and minds by the Holy Spirit. I am a blade of grass, you a grain of sand among many, and yet we are stars that shine, a little lower than the angels -- friends of God. The same door that opens to the Kingdom of God, the one that bears such a positve image in our minds of a welcoming knock, an invitaton to come in, will one day slam tightly shut and bar the way to those who reject God. But who slams it? The ones who reject God. Clark says that "[t]he ability to make associations, to think in metaphors and similes, is evidence of God's image in us. We think analogically, instinctively, because that is who we are. We read of God as Father, and associations with earthly fathers spring to mind. We say God is good and must immediately associate the abstraction of that word with, say, a father's love, a selfless person like Mother Teresa or Aunt Flora on your father's side once removed who never, never thinks of herself. Or maybe even the faithful, loving dog who always returns though neglected and mistreated by his master. That word "good" is unfenced, set free, encompassing everything that is the antithesis of bad. There's another thing she notes about such imaginative language: "Imaginative language --- poetry --- trains the mind in faith. For what is faith but divine realities we can only imagine, 'the substance of things hoped for, the evidence of things not seen' (Heb. 11:1)." I never thought of it that way. Metaphorming --- the ability to make associations between things --- is essential to a growing faith, a realization of the richness and otherworldly and fulsome character of the Good News. "When Jesus proclaims, 'I am the Bread of life,' he removes all our fences of seeing. He is entirely bread --- nourishing, flavorful, essential. Rising and resurrection are in the loaf, too. It is bread enough for the whole world, and of this Bread we must eat or perish. 'Unless you eat the flesh of the Son of Man and drink His blood, you have no life in you.' (John 6:53). Is this metaphor? Is this not mystery? Let us keep silent." After silence, after finding the wherewithal to be still and wait on God, poets and writers must learn to see and hear in a way that most other folks can glimpse only in the briefest of moments. There is a fierce velocity about the world. Drive the speed limit and you begin to realize that you are practically alone in this idiosyncrasy or experiment in puttering. Leaving work at the end of a long day, eager to be home, walk slowly to the car as the herd of commuters rush past. Notice the slant of the light at the end of the day. Consider what kind of tree grows by the bus stop sign. Walk, don't run. Begin to see. this way and that, shaking his head nervously. girl says, directing already, telling the boy to move over. NOW. slight glimpse, through a glass dimly, of heaven-song. That's not great poetry but merely an attempt to see and hear, to stop and slow down, to hear the roar on the other side of silence, like Suzanne says. It is still the first week in January, and I've got great plans. I've been thinking about seeing. There are lots of things to see, unwrapped gifts and free surprises. The world is fairly studded and strewn with pennies cast broadside from a generous hand. But --- and this is the point --- who gets excited by a mere penny? If you follow one arrow, if you crouch motionless on a bank to watch a tremulous ripple thrill on the water and are rewarded by the sight of a muskrat kit paddling from its den, will you count that sight a chip of copper only, and go your rueful way? It is dire poverty indeed when a man is so malnourished and fatigued that he won't stoop to pick up a penny. But if you cultivate a healthy poverty and simplicity, so that finding a penny will literally make your day, then, since the world is in fact planted in pennies, you have with your poverty bought a lifetime of days. It is that simple. What you see is what you get. In Annie Dillard's economy, the poor are rich and the full hungry. It sounds like the Kingdom of God. My daugther is singing in the next room, happily at home with her voice, and me, I am rich. To listen is free. She sings for pure joy and delight. I'll stoop and pick up this copper penny. The best things are free. You just have to listen. You just have to see. God help me learn to see, to stare hard at life until it gives up meaning. "Over and over again, we try to be amateur providences in someone's life. We are indeed amateurs, coming in and actually preventing God's will and saying, 'This person should not have to experience this difficulty.'" There are no amateur providences. one wrapped in rain's silent noise. chatter uninterrupted by the wash.
birch and fir trees, a crackling fire. In Scripture, rain is both a sign of blessing and a sign of God's judgment. For the latter, we need go no further than Noah and the great flood of judgment. For blessing, you could go anywhere. Job says "He says to the snow, 'Fall on the earth,' and to the rain shower, 'Be a mighty downpour'" (Job 37:6). But there is a definite emotional feeling associated with rain. If you haven't had it, you welcome it. You say things like "he is like the light of morning at sunrise on a cloudless morning, like the brightness after rain that brings the grass from the earth'" (2 Sa. 23:4). If you've had too much of it, or you get too much of it, you think of the "driving rain that leaves no crops" (Pr. 28:3). Sometimes, when you add rain to an otherwise bad day, it just feels worse, as when Ezra calls a sinful nation before him, confronting them with their sin, and we read that "all the people were sitting in the square before the house of God, greatly distressed by the occasion and because of the rain" (Ez. 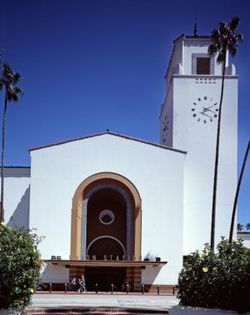 10:9). I have to think the rain was symbolic on that ocassion of the washing away of the peoples' sin, and yet they did not see it that way. 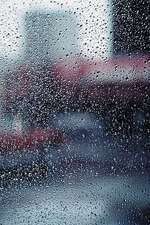 I have good memories of rain -- like walking through puddles with my then young children, or lying on a bed by an open window enjoying the rest afforded by a cloudy, raining day. I also have bad memories -- of a flooded basement, as a child, or the kind of flooding that wipes out whole communities. Rain truly is memory-laden. The challenge is to accept the good and hard rain of life in the same way the writer of Lamentations spoke of his great hardship: "Because of the Lord's great love we are not consumed, for his compassions never fail. They are new every morning; great is your faithfulness" (Lam. 3:22-23). Meanwhile, it sure is wet out there. Reading this today I wondered for a moment what Jane Kenyon was afraid of. Her poem paints a picture of contentment -- an afternoon at home --- much as the one I am enjoying today. But then we know, don't we? Things seem too perfect. Anything is possible, and surely something bad must happen to break the harmony of this scene. Most people, myself included, have this knowledge, the sense that when life is good then around the corner inevitably lies some struggle, trial, or evil. For most of us it is a momentary anxiety that passes, a fleeting thought (thank God) of impending . . . well, impending something, and yet we know not what. A preoccupation with anxiety leads to a neurosis where we live in constant fear of the future. Some even become psychotic, losing touch with reality as the insuuferable possibilities press in on them. I've wondered sometimes what keeps us sane. One thing I think does is a God-sanctified memory, an ability to remember God's faithfulness to us in the past and, thus, believe his promise of faithfulness in the future. Everyone (almost) remembers, but the anxiety-ridden cannot credit those memories of normalcy but fixate on the memories of struggle and hardship. Yet when God says remember in Scripture He is always reminding us of His Ffaithfulness to us. Another antidote to anxiety is thankfulness, a focus on the good gifts we have. When and if struck by some calamity, I'm sure I don't have it in myself not to despair, and yet I trust and hope the Holy Spirit will turn my focus to the good gifts of God. I used to dislike that verse from Phillipians 4:6, the one that says "Do not be anxious about anything. . . ." I mean, how do you make yourself not anxious? But then I realized the answer was really in the remainder of the verse, the "with thanksgiving" portion. You can't not worry sometimes, but you can change your focus, audibly thanking God for the inumerable blessings He has provided. So, here I am too, in the middle of "perfect possibility," well aware that DOOM may come tomorrow, and yet today I'm rehearsing my thankfulness, doing my part to remember, trusting that when calamity strikes I'll know my lines well enough that I will still be thankful. to pull the fences in and in. stopped even the tight circles. is dust, and the creekbed's dry. It goes without saying that old age brings its indiginities --- life is circumscribed, fenced in, and drawing down. And so I can identify with what Jane Kenyon is feeling, the hope that God will not tarry much longer but come and take his child home. I have a friend whose father is nearing 100, and yet he is more the horse that considers himself still viral, bucking at the fence, running this way and that (figuratively), with all kind of machinations. Unhappy. Difficult. But really, he just does not know what to do with himself in this small corral where nothing that once seemed good, from food to air and water, tastes of life anymore. When I watch my own mother, in the early stages of Alzheimers, I see her own narrowing pasture. One who loved to read can no longer concentrate on a book. She cannot drive. She is depressed at some level most of the time. She still enjoys food, so she eats, and I cannot blame her for that when her enjoyments are so limited. When we reach old age and physically or mentally cannot do much of what we once did, what is God's will for us? How is the remaining time redeemed? Do we stand at the fence and wait for the Master to come? Is that all? I know that deep inside my mother, or my friend's father, and anyone else of old age is still a person made in God's image, that deep inside the person is still there, only the body will no longer cooperate. These aged persons have a lot of time to think. They can spend it well, in thankfulness, or in regret. Visit your local nursing home and you'll see quite a disparity in how people redeem the time. Some are of sweet spirit, some hateful; it seems that little eccentricities that were always there are accentuated in the aged. We can ask them to pray. They have a lot of time to pray. We younger folks seem to have none. Our calendars are full; there's, practically empty. If we hadn't so minimized the role of prayer during life, perhaps they would see their task now, when they could easily pray all day for the needs of others, as extremely important and view the time they have as a blessed opportunity. Can we just ask them to pray? Maybe, just maybe, they will stop their running, forget the smallish corral, and realize they have no boundaries with prayer, that their prayers make it to the throne room of God just like everyone else's. When it comes to prayer. they can drive like anyone else, only they can enjoy the ride more. When he left, he didn't bother to leave a note. belongings that were only amusements anyway. really so different than any other male. body home. I don't know why. affection, as I have heard of that before. and fear when I came here. clod of earth hits the casket. The poor we no longer have with us. There is a summary of an interview by John Timmerman with Kenyon for Mars Hill Journal here. Kenyon's poetry is rich with images, yet very accessible. I think people struggling with depression or illness would find a empathetic soul in her, as she so often dealt with depression and then, of course, with cancer. For me, I just love her "luminous particular:" that ability to see what transcendant truth was behind the ordinary. Lord, When Did We See You? A jay settled on a branch, making it sway. gave way to the deepening drift below. I happened to see it the moment it fell. who cry, ouraged, Lord, when did we see you? To say that poet jane Kenyon suffered from depression is insufficient to convey the sense of her despair. Her own poems help you to feel what she must have felt, that sense of loss of hope, of spiritual barrenness. 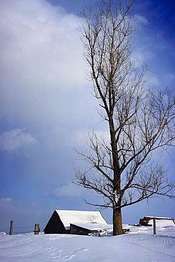 This poem uses some images from Winter, from nature, as metaphors for that loss --- the last shriveled apple lost, sunken under the weight of snow, just as last hope suffocated by the weight of sorrow. The eagerness of dusk, the sense that the world is darkening and is almost dark. The wondering if God is there or, if He is, if He has abandoned you. These are not plesant things to read, and yet they are at times not unlike some portions of the Psalms. At this moment I'm thinking of Psalm 102, where the Psalmist says "[m]y heart is blighted and withered like grass; I forget to eat my food. Because of my loud groaning I am reduced to skin and bones. I am like a desert owl, like an owl among the ruins. 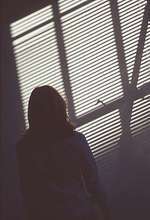 I lie awake; I have become like a bird alone on a roof" (Ps. 102: 4-7). Like the Psalmist, Kenyon could look to God's promises, but that did not make the despair go away. She could not simply shake it off. Rather, like the Psalmist, she had to wait for God to come. And He did. his wife beside him now. I scattered on the snow. The cats doze near the stove. I love accessible poetry, and the late Jane Kenyon's spare poems, rich in images of the particulars of everyday life and yet simple and direct, typify all that I like about poetry. Yes, all, because Kenyon ultimately connected to the Universal behind all those (as her husband Donald Hall called them) "luminous particulars" of her poetry as she came to faith in God. Kenyon died in 1995 at the age of 48 of leukemia after many years of writing poems rooted in the particulars of life on and around her New Hampshire farm. She had two great struggles in life: the lifelong struggle with bipolar disorder which gave her over to bouts of depression, and then to cancer, which ultimately took her life. And yet she lived well. She noticed things. Her poems have the effect of drawing the reader in where you ultimately make the poem your own. For example, in "This Morning," I can feel what it must have been like there on that New Hampshire farm, and then I am transported to my childhood room, waking up and "hearing" the snow outside, just knowing that the quiet means it has fallen, listening for the sounds of my parents, for the smell of coffee and eggs, joyful at the prospect of another school cancellation and an impromptu holiday. The images are different, the setting suburbia and not a New England farm, but the poem has worked its magic on me. Kenyon has done her job. She has made me remember and feel something rich. On of her own favorite poems was the following, called "Let Evening Come." moving up the bales as the sun moves down. Let the cricket take of chaffing as a woman takes up her needles and her yarn. Let dew collect in the hoe abandoned in long grass. Let the stars appear and the moon disclose her silver horn. Let the wind die down. Let the shed go black inside. Let it come as it will and don’t be afraid. God does not leave us comfortless. God does not leave us comfortless. I encourage you to read Jane Kenyon. You'll find the true, the good, and the beautiful among her words. "Inside a moment," Emily Dickinson wrote, "centuries of June." But then Dickinson had a lot of time on her hands, didn't she? Not many of us have the kind of time that Dickinson had to simply focus on the moment we are in, with the tick tick tick of the clock and the e-mails filling our inboxes and the phone ringing and the to-do list that nags at us daily. How do we stop our movement? How do we slow down? Unfortunately, sometimes it takes sickness to force us to stop the running. I've had a taste of that before, and I had an encounter with that yesterday, as the quick onslaught of the flu caught me by surprise and put a halt to life as I usually know it. I could not even read. Nausea is very distracting. I could not even rest well, as I hurt no matter which way I turned. I could not even sleep well. I really could do nothing but lie there and think and think and think. For a moment I thought "I have't been sick like this for years. Am I dying?" I'm serious. (Well, you know how men are.) When your body hurts, when you know the work is stacking up, when all the things you need to get done aren't getting done, it's easy to focus on you you you until you make life miserable for yourself and those around you. I've been there before. Yes, I did some of that. But then I began to think of what I had in that moment. I looked around my room and began to be thankful for the home I had. I heard my children downstairs talking and was thankful for them. I remembered my parents, my sisters, my childhood friend, an encouraging word, my church family, my pastors, my cat, my books, and Bette Jean Ellis, the very large African-American nurse who nursed and prayed me to health when I was in the hospital once for six weeks with a life-threatening illness and gave me a book of God's Precious Promises with my name mispelled on the front and these words inside: "To Steven, I hope that you will enjoy this little book, to know that God is able to do all things, and that in all things He is in control. God has an even greater work for you. Listen for that small voice. Do his will not your own will. In Christ, Bette Jean Ellis, 10/14/93. Well, it was just the flu, I know, from which I'm much better today, and I know you've all had it and maybe worse. But I'd have to say it was worth having if for no other reason than I remembered Bette Jean Ellis' words to me. "Inside a moment, centuries of June." Make the most of the moment. Redeem the time. English poet T.S. 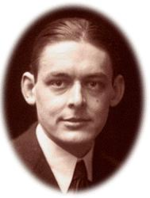 Eliot became a Christian in 1927 and was baptized in the Anglican church. I've always liked this poem which, though in many ways like a complaint, demonstrates that for those who encounter Christ life is never the same. It is the Death of the old life and old gods and the beginning of a new life -- even if it is one that is not easy at first. One can surmise that Eliot, like the Magi speaking in the poem, having encountered Christ, has a profound sense of alienation from the world around him. It's a natural feeling for one who belongs to another Kingdom. She waits, but she is not fine. among the ruins, a bird alone. manicured shell of her life. her mother, before he returned it to his vest pocket, sighing. "Come home." He could not see who it bid. eyelids flutter, sometimes, and she envied their dreams. Rosa," and placed a small box in her hand as he held her. cross, silver, with turquoise studs at each end, on a silver chain. "Train 402, Track 12, Tijuana. Now boarding." waiting. The music is playing. goodbyes. It was over. He was coming, wasn't he? floor. Rhythmically, she swept the mop back and forth, like a dance. there the snores of too-long-waiters, those who had given up consciousness. Waiting. All going home. All longing for God to come. earthy reality, a new world found. reborn in love in a new world come. in her lit room, a gift of darkness. what in-breaking wildness fills her? this blaze, this sudden midnight. the femur to the heel, heel to the foot bone. And afterwards, they got up to dance. from tumbling off Picasso's women. from the rim of history toward Him. "Omit needless words!" said Will Strunk. Indeed. I've said too much already. But maybe tomorrow you'll have a better appreciation for prepositions, the great connectors of our shared language. it's just that we can't stand up anymore by ourselves. will you give us a hand? At this time of year, I'm aware that some people must feel as did the Psalmist, when he wrote so achingly, "I am like a desert owl,/ like an owl among the ruins./ I lie awake; I have become/ like a bird alone on a roof" (Ps. 102: 6-7). Single pigeons. Blackbirds singing in the dead of night. Like Eleanor Rigby and all the lonely people. I guess Paul McCartney knew something of what it might be to be lonely, even surrounded as he was by people. This calls for compassion I don't always have, sensitivity that lies beneath my superficiality, awareness of others in the midst of distraction. Cheeriness and holiday spirit for such folk are like poison. You can't fix them. You can be with them and extend a hand, maybe, while God chips away at their darkness. That's Advent, for some. there must be joy tonight. They put it on the street. They shout it from the street. This poem is based on fact. As a young child I remember driving cross town, to the other side of the tracks in our largely segregated town, to deliver clothes to an African-American woman, Lizzie, who also kept what seemed to be as many as 15-20 foster children, mostly boys. I loved seeing the lights. 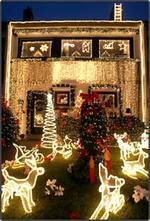 They used a lot of multi-color lights and had all kinds of lit decorations in the yards of these modest homes. Their decorations were much better than ours. They lit my imagination. They believed in Christmas. His hand, an heir to His estate, and on my way Home. hiss the bright curls of the leaves. Now! booms the muscle of the wind. After reading here book of poems, entitled Thirst, and reviewing her book, I thought I was done with Mary Oliver. But I'm not. I really enjoy these poems and keep returning to them. This one really shines with God's light in creation, and in us. The trees "almost" save her, but don't, really, and I know what she means. Their age and beauty testify to God's goodness. She is "so distant from the hope of myself," and I feel the humility that walking among great trees, and before a great and holy God, may bring. And God calls us to shine like stars, to hold out light, as is urged here. Nor does the lily have a secret eye that shuts until morning. Jesus said, wait with me. But the disciples slept. and heaven knows if it ever sleeps. lay still and waited, wild awake. must be a part of the story. When Jesus said "wait with me," I take it he did not mean to simply stay as opposed to leave. He meant stay awake, be alert, watch, be expectant -- He asked the disciples to have a Godward awareness. And yet, they slept. I know how they must have felt. Close your eyes to pray and it's an invitation to sleep. That's one reason that what praying I do I often do with eyes wide open and feet in locomotion. And yet, the phrase portends more, much more. It must suggest to us that we must stay close by the side of Jesus, eyes fixed on Him, watching for how He is at work in the world, reading the signs of the times, knowing his presence, seeing that "[t]he cricket has such splendid fringe on it feet," praise God, and the wind and stars how they tell of the glory of God with prescient whispers. Even sleep tells of our humanness, so I need not chide myself too much for falling asleep in my prayers. Maybe the non-human world can stay awake, can watch and wait, but I can't and you can't. But that too the poet says is all a part of this Story. But thank God He's up all night. It's His watch, always. In the very first line of the very first poem of Mary Oliver's new collection of poetry, entitled Thirst, she says "My work is loving the world" (Messenger). In the very last poem of this slim volume, she says "Love for the earth and love for you are having such a long conversation in my heart" (Thirst). These poems bookend a new affirmation of faith for Oliver: For the first time in her life, at the age of 71, she is writing from an apparent Christian framework, loving the world of marshes, ponds, beaches, bears and dogs and the Creator of all these things she has so long loved. There are poems about ribbon snakes, roses, a great moth, otters, Percy (her dog), and that great conversation I mentioned ("And still I believe you will/ come, Lord: you will, when I speak to the fox,/ the sparrow, the lost dog, the shivering sea goose, know/ that really I am speaking to you" (Making the House Ready for the Lord). and said some holy words. In the end though, after the poems of creation and poems of grief, what stand out are the affirmations of faith. In "Coming to God: First Days," she says "Lord, I would run for you, loving the miles for your sake./ I would climb the highest tree/ to be that much closer." In "Six Recognitions of the Lord," she celebrates "everywhere the luminous sprawl of gifts,/ the hospitality of the Lord and my/ inadequate answers as I row my beautiful, temporary body/ through this water-lily world." And, at last, in "Thirst," she writes "Another morning and I wake with thirst/ for the goodness I do not have. I walk/ out to the pond and all the way God has/ given us such beautiful lessons." Mary Oliver thirsts for God. Some will disagree with her lifestyle (Molly Malone Cook was truly her life partner), but her faith seems real as does her love of the world and her experience of grief. Those are things that must resonate with us, as we are human too. Most helpful is the accessibility of these poems. Many people will be able to read and enjoy them. The language is simple yet elegant. The "space" in the poems created by their economy is an almost aural testimony to the awe with which she regards the life of the world and, now, the One who made it all. I highly recommend this book of poetry. It's like walking through a room of Monet paintings: there's not much not to love. Use it to stimulate your own love of nature and of nature's God. Reading this poem by Mary Oliver, another from her new book entitled Thirst, I think of Psalm 24:1 and the Psalmist's proclamation that "[t]he earth is the Lord's, and everything in it, the world, and all who live in it. . . ." I'm unsure of the reason for the title; a prior poem was entitled "Musical Notation: 1," and it is, like this one, a reflection on what is made and the Maker. So perhaps it is the music of Creation? I don't know. But I like this simple reflection that everything is His, everything. The door, the door jamb. The wood stacked near the door. that leads to the door. and, simply said, all the rest. all this will be there, and it is. I fill my arms with firewood. I turn and enter His house, and close His door. And you may never look at doors or door jambs with indifference, but, rather, with the Architect's heart. I said earlier that I was reading and savoring one Mary Oliver poem a day, from her new book, Thirst, but I spoke to soon. I have so enjoyed them that I am halfway through the book. They seem to fall into two categories -- poems about grieving and poems of reflections on nature -- but, whatever the category, they are full of faith. The language is simple, and yet not simplistic. They have depth, and yet they are very accessible. If you've ever asked yourself, is He really there?, and then wondered, only to have Him show up some time later, you may like this one. What did Mary Oliver grieve? It was the death of her friend, agent, and companion Molly Malone Cook. Mary Oliver was a lesbian. I'm sad to know this, sad because this lifestyle falls so short of God's design for relationships, and now, even that is gone for her. And yet my disagreement with that lifestyle does not take away the empathy one can feel. Her love was real, as far as it went. So too, her grief. And the faith she has -- and her desire to see Jesus -- may well carry her beyond such marred relationships to the One who loves her as no one else can. One of the books I am very slowly reading and savoring is poet Mary Oliver's Thirst, published this month. I don't like a lot of poetry, but there isn't much here (maybe none) that I do not like thus far! Oliver is a Pulitzer prize winning poet who often writes poetry based on her reflections on nature, which she does here as well, but who increasingly has begun to write of Christian faith. That's not necessarily to make Oliver an evangelical Christian (I note the book is published by Beacon Press, which is under the auspices of the Unitarian Universalist Association of Congregations, a non-Christian religious group), but one must evaluate any art on its own basis and not on the basis of the artist's philosophical or religious persuasion, at least in the first instance. So, I'll be offering a few of Oliver's poems from time to time in the next few weeks, and a full review of her book a little later on. I like this particular poem for the love of creation it reflects, its accessibility, and it's final lines inviting the Creator to "come in, come in:"
as I do all morning and afternoon: Come in, Come in. I suppose there is more than one way to understand the poem, but for me the whole house and animal theme is a metaphor for a life that is not shining, that is broken, and yet one that is open to people and animals and, ultimately, to the Lord -- one that says everyday, "come in, come in." "There has to be some overwhelming experience of love, or of something, that the poem chronicles or records. It cannot be the subject of that love. If it's only that, if it's only language, then the poem is not going to survive. Poems that survive are the ones that come out of human beings who've had some expeience that needs to be testified to or recorded or given body. They are not just pleasing in themselves. We need to be able to master and explore and mine the nature of language itself, but it's the degree to which the poem is more than that which gives you real art. Some previous, wordless experience is being given a verbal equivalent. This is what I am looking for: poetry that lets the wordless original experience shine through the words." Reading this interview with the poet Franz Wright will make you thankful, not envious of a "gift"for language which has caused him as much pain as it has caused him bliss. Winner of many honors, including the Pulitzer Prize, Wright spent years as an alcoholic, a manic depressive, and in all manners of self-abusive behavior -- before becoming a Christian and being baptized in the Catholic Church. Thank God. He is, by his own admission, still a rough character, but he has been changed by Love. If I had met him on the street several years ago, he would have looked like a scary, deranged homeless person. (He said that, not me!) I would not have known he was a brother in Christ on his way to realizing this for himself. I suspect I would have been on my way as quickly as I could. I thought of this today, in near isolation, in 18 degree bitter cold on the top of Roan Mountain, near the Tennesse-North Carolina line, when two men asked for a ride down the mountain with my family. Two strangers. I let them in. The older one said "Up here we're backpackers; in the city we're homeless people." That was a curious thing to say. We remembered the admonition that we are not to "forget to entertain strangers, for by so doing some people have entertained angels without knowing it" (Heb.13:3). They could have been angels, they could have been like Franz Wright, or they could have been just plain backpackers. But one thing is for sure: I don't know how to heed that Scripture without some risk. The priest who helped Franz Wright said he was scared of the guy at first. I'll bet he was. I was a little scared too - now that I think about it. Scott Cairns, whose poem "Yellow" I reprinted yesterday, is a poet worth reading. This book I pulled off my shelf, now out of print, called Odd Angles of Heaven: Contemporary Poetry By People of Faith, which a collection of work by several Christian poets, is odd. I cannot say I like most of it, but some I find provocative, some challenging, and some just plain delightful. This poem falls in that latter category. I enjoy the title, which provokes me to thoughtfulness, as much as its content. to a shaded spot near a field. moving the small flowers in the field. that grip of flowers with its face. A field, sheep, a woman with a hand to her brow, a cool breeze -- all these are good and yet point beyond themselves to something more richer, deeper, and more delightful that lie beyond -- not an abstraction, not some impersonal force, but a loving God who has created everything out of love for us, for our delight. As Alister McGrath says. "[T]he supreme aim of the study of nature is 'to perceive the eternal word of God reflected in every plant and insect, every bird and animal, and every man and woman.'" (Alister McGrath, Creation, citing Ninian of Whithorn). Look around. It's delightful what you see. "Athletes take care of their bodies. Writers must similarly take care of the sensibility that houses the possibility of poems. There is nourishment in books, other art, history, philosophies -- in holiness and mirth. It is in honest hands-on labor also; I don't mean to indicate a preference for the scholarly life. And it is in the green world -- among people, and animals, and trees for that matter, if one genuinely cares about trees. A mind that is alive and inquiring, compassionate, curious, angry, full of music, full of feeling, is a mind full of possible poetry. Poetry is a life-cherishing force. And it requires a vision -- a faith, to use an old-fashioned term. Yes, indeed. For poems are not words, after all, but fires for the cold, ropes let down to the lost, something as necessary as bread in the pockets of the hungry. Yes, indeed." I am, I regret, a sporadic writer of poetry. I feel the need for inspiration, and this statement is inspiring, the image of poems being "fires for the cold, ropes let down to the lost." Do I really believe that? Sometimes I do. But I doubt that many people would have that opinion of poems. Poems don't do anything, they might say. They don't persuade, convey information, or tell a good and entertaining story. In addition, they befuddle most folks who aren't in the habit of reading poems, as their meaning is not always apparent. In truth, they have a point. Many poems have no staying power, no sound or image that resonates with us. A poet has their work cut out for them. Here's a little poem that has no great big point to make, takes no cause, and does not attempt to persuade. What it so subtly does, and does well, is simply observe a person with a empathetic eye, and in so doing, it helps us be more human. sure signs she knows she has no business here. a yellow dress. I think she should try it on. Now that, as Oliver says, is "fire for the cold," cold human hearts that is. Reading that, I'm a little less cold. Yes, she should try on the yellow dress.